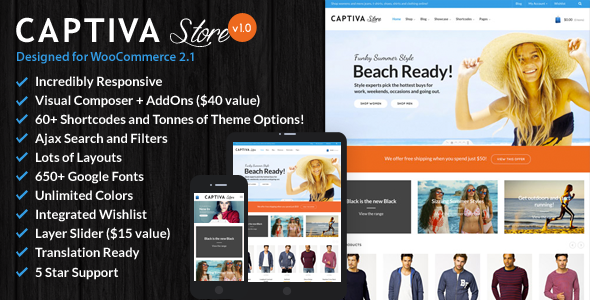 Captiva is a premium Woocommerce Responsive WordPress Template. This theme is suitable for any kind of Fashion Shop, Mobile Shop, Computer Store, High-tech Store, Gift Shop, Electronics shop and all kinds of marketplace business that needs a feature rich and beautiful presence online. PLUS, Visual Composer Add Ons Pack! HOT! Item Reviewed: Captiva - Responsive WordPress WooCommerce Theme 9 out of 10 based on 10 ratings. 9 user reviews.